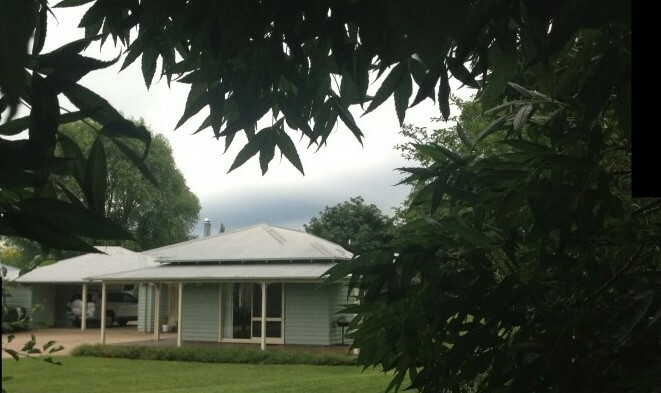 Glen Waverly Farm Stay is a modern one bedroom self contained cottage on a 19 acre hobby farm 3 klms south of Glen Innes NSW 2370. View the stunning sunsets from your own private verandah. Watch the alpacas graze in the paddocks and wander through the garden. The bedroom has a queen size bed with quality linen and alpaca doona. The living area has 2 recliner chairs for your comfort whilst watching TV,DVD or reading. Available is a single bed and a rollaway for extra guests. There is a microwave, electric frypan, single hotplate, single hot plate and toaster. The electric kettle barbecue on the verandah is ideal for those warm summer evenings.. A basket breakfast is provided for A$20.00 per couple. No highway noise and undercover parking is available for those rainy days and also protection from the sun. The cottage is air-conditioned and also has a wood heater for your comfort. Contact: Adrian or Betty Whitten for further details.